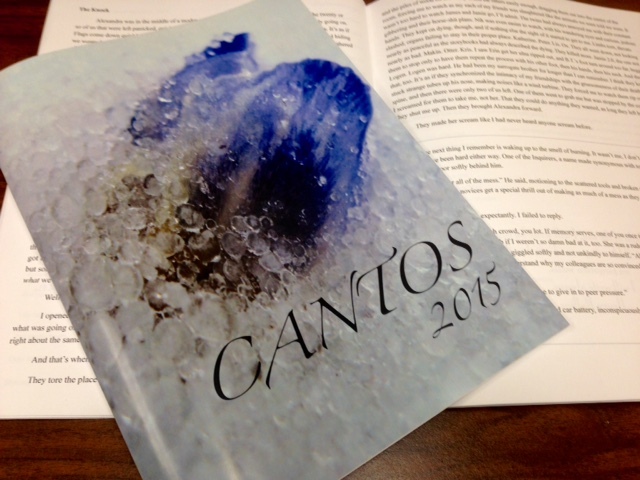 Cantos, Lenoir-Rhyne University’s literary magazine, featuring cover photography by a schwiebert (Annette Schwiebert). I have taken a break from reading portfolios to offer this short post, one inspired by seeing so many of my students’ names in the pages of Cantos, Lenoir-Rhyne’s literary magazine. From the Italian for song, a canto is a section of a long poem, a chapter of sorts, and the students’ work both in the magazine and in their portfolios for ENG 281 serves as a last canto for the course, a final chapter in a series of innovative exercises that they, and I, have produced in our multi-genre Introduction to Creative Writing course. I look forward to reading their selections in Cantos after I finish reading their portfolios, but the two aren’t mutually exclusive. Some of the pieces in Cantos appear in their portfolios as well. Cantos also features photography by ENG 281.02 student a schwiebert (Annette Schwiebert) and an essay by Eddie Stiltner (ENG 231, Fall 2014). Kati Waldrop (ENG 281) serves as Cantos’ Editor-in-Chief, and Peyton Hoyle (ENG 281) and Alexis Monthony (ENG 131, Spring 2014) serve as staff readers.